It's been almost 2 years since I transitioned away from CHILDish. But still to this day I get emails asking to order more personalized dishes. I'm amazed and humbled that CHILDish struck such a cord with so many families. I put so much love and energy into CHILDish. My customers and friends (and customers turned friends) have cheered me on every step of the way. I'm so grateful for the amazing support you gave me! I'm also proud of what CHILDish has become and all of the doors that have opened because of it. I am so excited to see CHILDish start up again with a new owner and fresh excitement. Kimberly Hall of Nottene is an illustrator and designer who trained at Central St Martins in London. Kimberly has worked for companies like Hussein Chalayan, Coach, the Denver Art Museum, and the Village Voice. She has 2 daughters, a husband, and a new (old) row house in Philadelphia. Recently Kimberly was featured on Design Milk, where she was asked to make an outfit from Marimekko fabric, read all about her design process at Make It Marimekko. She also runs an Etsy store where she sells vintage clothing and includes a sketch with purchase. I met Kimberly Hall at Altitude Summit 2013. I was hoping the trip would give me some inspiration for CHILDish, and it did! One of the very first people I met was Kimberly. We sat next to each other during the Wednesday night Umba Box dinner. I was drawn to her personality and our mutual love for vintage, bold pattern and design, and we simply hit it off. Kimberly has designed two sets of personalized dishes specifically for CHILDish. I am thrilled to be able to launch these dishes and have them for sale here. Kimberly used her unique illustration style to come up with a design for boys and one for girls. She also sketched different images for the plate and bowl, which makes for a fun set. As with all CHILDish products these are made to order and can be personalized with your child's name. A limited hair colour choice is available, blonde, brown or red. I love the soft innocence of these illustrations. They remind me of Holly Hobby and my love for all things Little House on the Prairie as a child. My daughter Julia has been using this set for weeks and requests this design for every meal. I asked Kimberly to answer a few questions so we can learn a bit more about her. I am always fascinated on how other working mothers keep it all together. Hmmm, I'm not really sure. I just try to follow my instincts and make work that challenges me. I have been working as an apparel and accessories designer since grad school ended in 2006 so I suppose my illustration work has grown out of that. You're a mom and an artist/designer, how do you juggle it all? I don't sleep as much as I like, that's for sure. But I am a bit of a night owl so I end up staying up late a lot. I also commute to NYC for my job and I try to use that commute time for my work so that I can be free to focus on home things when I am at home. Cuddle in bed in the mornings. Our bedroom is at the top of the house in the back and it feels like a little nest in there when we wake up in the morning light. If you could pick up your family and live in another country for a year, where would you go? My husband and I lived in London for 2 and a half years when I was in grad school so we always talk about going back once the girls are a little older…my favorite city in Europe might just be Brussels though…and of course the thought of living in Paris would have to be pretty high on the list too. The nice thing about living in Europe though, is that you can visit lots of other countries pretty easily! If you had a day to yourself in New York City, what would you do? Ha, I have 5 days a week in NYC to myself and I only get to work! But really I think I would like to visit friends and shop if I was free to do as I liked. Maybe start with brunch in Brooklyn, hit some of my favorite thrift stores in Queens, go to my favorite paper stores in Manhattan, take the train home so that I could spend a little time drawing too! Is there a creative medium you haven't tried, but would love to? I've tried a lot of them and I really enjoy the variety. I'm not much of a painter though, I'm naturally inclined towards drawing I think, but I have been toying with watercolor lately. It's been a lot of fun so far. Kimberly's dishes will be available for sale for a limited time. Click here to order before they are gone! I made this Easter Tic Tac Toe printable game a few years ago. A simple game to put in Easter baskets or have at the dinner table. There is a colour version and black and white version for the kids to colour themselves. Gotta run and decorate some Easter Eggs! You asked for it, you got it! The number one request from my customers is the option for rush shipping. I've been working closely with my manufacturer for over a year to make this a reality, and here it is! Rush shipping takes 2-3 weeks. Tracking is available. Rush shipping is an additional $10, and available within Canada and the US. Complete list of shipping prices. On an average day I am juggling being a stay-at-home-mom while running CHILDish, taking courses, creating designs and the list goes on. I love teaming up with other moms to do business, they "get it". 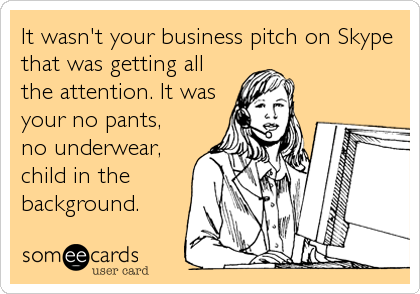 Yesterday while having a Skype meeting by 3 year old son walked in the room with his pants and underwear around his ankles. It made for a great laugh.